A builder instructs the AWS Cloud9 IDE how to build a project's files. A runner instructs the AWS Cloud9 IDE how to run files of a specific type. A runner can use a debugger to help find any problems in the source code of the files. Use a builder to build your project's files. See Build Your Project's Files. Use a runner to run (and optionally, to debug) your code. See Built-In Build, Run, and Debug Support and Run Your Code. Change a built-in runner to run (and optionally, to debug) your code in a different way from how it was originally defined. See Change a Built-In Runner. Use a runner to run (and optionally, to debug) your code with a custom combination of file name, command line options, debug mode, current working directory, and environment variables. See Create a Run Configuration. Create your own builder or runner. See Create a Builder or Runner. The AWS Cloud9 IDE provides built-in support for building, running, and debugging code for several languages. For a complete list, see Language Support. Built-in build support is available on the menu bar with the Run, Build System and Run, Build menu commands. To add support for a programming language or tool that isn't listed, see Create a Builder or Runner. Built-in run support is available with the Run button, and on the menu bar with the Run, Run With and Run, Run Configurations menu commands. To add support for a programming language or tool that isn't listed, see Create a Builder or Runner and Create a Run Configuration. Built-in debug support is available through the Debugger window. To display the Debugger window, choose the Debugger button. If the Debugger button is not visible, choose Window, Debugger on the menu bar. Open a file that corresponds to the code you want to build. On the menu bar, choose Run, Build System, and then choose the name of the builder to use, if it isn't already chosen. If the builder you want to use isn't listed, stop this procedure, complete the steps in Create a Builder or Runner, and then return to this procedure. Open a file that corresponds to the code you want to run, if the file isn't already open and selected. To run the code with the closest matching built-in runner, choose Run, Run. If AWS Cloud9 cannot find one, this command is disabled. To run the code with the run configuration that AWS Cloud9 last used, choose Run, Run Last. To run the code with a specific runner, choose Run, Run With, and then choose the name of the runner. If the runner you want to use isn't listed, stop this procedure, complete the steps in Create a Builder or Runner, and then return to this procedure. To run the code with a specific runner with a custom combination of file name, command line options, debug mode, current working directory, and environment variables, choose Run, Run Configurations, and then choose the run configuration's name. In the run configuration tab that is displayed, choose Runner: Auto, choose the runner you want to use, and then choose Run. If the runner you want to use isn't listed, stop this procedure, complete the steps in Create a Builder or Runner, and then return to this procedure. On the run configuration tab for your code, choose Run in Debug Mode. The bug icon turns to green on a white background. For more information, see Run Your Code and Create a Run Configuration. Open each file that you want to set a breakpoint in. At each point in a file where you want to set a breakpoint, choose the blank area in the gutter to the left of the line number. A red circle appears. To remove a breakpoint, choose the existing breakpoint in the gutter. To disable a breakpoint instead of removing it, in the Debugger window, in Breakpoints, clear the box that corresponds to the breakpoint you want to disable. To enable the breakpoint again, select the box you cleared. To disable all breakpoints at once, in the Debugger window, choose Deactivate All Breakpoints. To enable all breakpoints again, choose Activate All Breakpoints. If the Debugger window isn't visible, choose the Debugger button. If the Debugger button isn't visible, on the menu bar choose Window, Debugger. In the Debugger window, in Watch Expressions, choose Type an expression here. Type the expression you want to watch, and then press Enter. To change an existing watch expression, right-click the watch expression, and then choose Edit Watch Expression. Type the change, and then press Enter. To remove an existing watch expression, right-click the watch expression, and then choose Remove Watch Expression. Run your code as described in Run Your Code. Whenever a run pauses, you can do the following in the Debugger window, as shown. Run your code to the next breakpoint (or to the next logical stopping point if there are no more breakpoints): Choose Resume. Skip over running statement by statement through the next method or function call: Choose Step Over. Run your code to the next statement and then pause again: Choose Step Into. Stop running statement by statement in the current method or function call: Choose Step Out. Disable all existing breakpoints: Choose Deactivate All Breakpoints. Re-enable all breakpoints: Choose Activate All Breakpoints. Don't pause whenever the code throws an exception: Keep choosing the exceptions behavior button until the tooltip reads Don't pause on exceptions (gray). 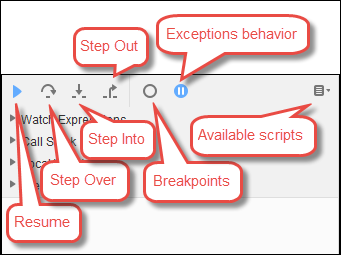 Pause whenever the code throws an exception: Keep choosing the exceptions behavior button until the tooltip reads Pause on all exceptions (red). Pause only when the code throws an uncaught exception: Keep choosing the exceptions behavior button until the tooltip reads Pause on uncaught exceptions (blue). Open an available script: Choose Available internal and external scripts, and then choose the script. View the list of current watch expressions: See the Watch Expressions area. View the execution path that brought the code to the current breakpoint: See the Call Stack area. View the list of local variables: See the Local Variables area. Disable individual breakpoints: In Breakpoints, clear the boxes that correspond to the breakpoints you want to disable. To enable the breakpoints again, select the boxes you cleared earlier. Whenever a run pauses, you can also pause your mouse pointer on any displayed piece of code (for example, a variable) to show any available information about it in a tooltip. On the menu bar, choose Run, Run With, and then choose the built-in runner you want to change. Stop the runner from trying to run your code by choosing, Stop on the run configuration tab that displays. Choose Runner: My Runner, where My Runner is the name of the runner you want to change, and then choose Edit Runner. On the My Runner.run tab that is displayed, change the runner's current definition. See Define a Builder or Runner. Choose File, Save As. Save the file with the same name (My Runner.run) in the my-environment/.c9/runners directory, where my-environment is the name of your AWS Cloud9 development environment. Any changes you make to a built-in runner apply only to the environment you made those changes in. To apply your changes to a separate environment, open the other environment, and then follow the preceding steps to open, edit, and save those same changes to that built-in runner. In the box next to Run and Restart, type the name that will display on the Run, Run Configurations menu for this run configuration. In the Command box, type any custom command line options you want to use. To have this run configuration use the runner's predefined debugging settings, choose Run in Debug Mode. The bug icon will turn to green on a white background. To have this run configuration use a specific working directory, choose CWD, choose the directory to use, and then choose Select. To have this run configuration use specific environment variables, choose ENV, and then type the name and value of each environment variable. To use this run configuration, open the file the corresponds to the code you want to run. Choose Run, Run Configurations on the menu bar, and then choose this run configuration's name. In the run configuration tab that displays, choose Runner: Auto, choose the runner you want to use, and then choose Run. Any run configuration you create applies only to the environment you created that run configuration in. To add that run configuration to a separate environment, open the other environment, and then follow the preceding steps to create the same run configuration in that environment. To create a builder, on the menu bar, choose Run, Build System, New Build System. To create a runner, on the menu bar, choose Run, Run With, New Runner. On the builder tab (labeled My Builder.build) or runner tab (labeled My Runner.run) that is displayed, define the builder or runner. See Define a Builder or Runner. After you define the builder or runner, choose File, Save As. For a builder, save the file with the .build extension in the my-environment/.c9/builders directory, where my-environment is the name of your environment. For a runner, save the file with the .run file extension in the my-environment/.c9/runnders directory, where my-environment is the name of your environment. The file name you specify will be the name that is displayed on the Run, Build System menu (for a builder) or the Run, Run With menu (for a runner). Therefore, unless you specify a different file name, by default the display name will be My Builder (for a builder) or My Runner (for a runner). To use this builder or runner, see Build Your Project's Files or Run Your Code. Any builder or runner you create applies only to the environment you created that builder or runner in. To add that run builder or runner to a separate environment, open the other environment, and then follow the preceding steps to create the same builder or runner in that environment. This procedure assumes you have already begun to create a builder or runner by choosing Run, Build System, New Build System (for a builder) or Run, Run With, New Runner (for a runner). On the builder or runner tab that is displayed, use JSON to define the runner or builder. Start with the following code as a template. For a builder, start with this code. For a runner, start with this code. cmd: Represents a comma-separated list of strings for AWS Cloud9 to run as a single command. When AWS Cloud9 runs this command, each string in the list will be separated by a single space. For example, AWS Cloud9 will run "cmd": [ "ls", "$file", "$args"] as ls $file $args, where AWS Cloud9 will replace $file with the full path to the current file and $args with any arguments entered after the file name. For more information, see the list of supported variables later in this section. script: Represents a bash script (which can also be specified as an array of lines as needed for readability) that the runner executes in the terminal. working_dir: Represents the directory that the runner will run from. info: Represents any string of text you want to display to the user at the beginning of the run. This string can contain variables, for example Running $project_path$file_name..., where AWS Cloud9 will replace $project_path with the directory path of the current file and $file_name with the name portion of the current file. See the list of supported variables later in this section. selector: Represents any regular expression that you want AWS Cloud9 to use to identify the file names that apply to this runner. For example, you could specify source.py for Python files. debugger: Represents the name of any available debugger you want AWS Cloud9 to use that is compatible with this runner. For example, you could specify v8 for the V8 debugger. debugport: Represents the port number you want AWS Cloud9 to use during debugging. For example, you could specify 15454 for the port number to use. The following table shows the variables you can use. The directory of the current file, for example, /home/ec2-user/environment or /home/ubuntu/environment. The full path to the current file, for example, /home/ec2-user/environment/hello.py or /home/ubuntu/environment/hello.py. Any arguments entered after the file name, for example, "5" "9". The name portion of the current file, for example, hello.py. The extension of the current file, for example, py. The name of the current file without the file extension, for example, hello. The full path to the packages folder. The full path to the current project folder. The directory of the current project file, for example, /home/ec2-user/environment/ or /home/ubuntu/environment/. The name of the current project file without the file extension, for example, my-demo-environment. The name of the current project file without the extension. The hostname of the environment, for example, 192.0.2.0. The hostname of the environment with the relative path to the project file, for example, https://192.0.2.0/hello.js. The full URL to access the environment, for example, https://192.0.2.0.. The port assigned to the environment, for example, 8080. The IP address to run a process against the environment, for example, 0.0.0.0. As an example, the following builder file named G++.build defines a builder for GCC that runs the g++ command with the -o option to compile the current file (for example, hello.cpp) into an object module. Then it links the object module into a program with the same name as the current file (for example, hello). Here the equivalent command is g++ -o hello hello.cpp. As another example, the following runner file named Python.run defines a runner that uses Python to run the current file with any arguments that were provided. For example, if the current file is named hello.py and the arguments 5 and 9 were provided, the equivalent command is python hello.py 5 9. Finally, the following runner file named Print Run Variables.run defines a runner that simply outputs the value of each available variable and then stops. "info": "file_path = $file_path, file = $file, args = $args, file_name = $file_name, file_extension = $file_extension, file_base_name = $file_base_name, packages = $packages, project = $project, project_path = $project_path, project_name = $project_name, project_extension = $project_extension, project_base_name = $project_base_name, hostname = $hostname, hostname_path = $hostname_path, url = $url, port = $port, ip = $ip"